Beverly's Official Blog | News and findings from world of crafts, scrapbooking and more: Embroidery is hot! 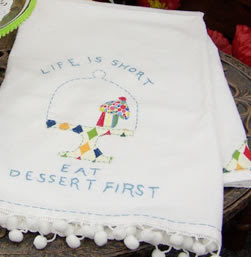 It's everywhere these days..... we even have an "embroidery how to" on our web site. If you're new to embroidery, Beverly's has lots of books to teach and inspire you. For fresh, fun patterns check out the Sublime Stitching Craft Pad from Jenny Hart. This month we have it on sale for $10.97. Embroidery floss is on sale this month as well - 4 for $1 - can't beat that! Laura, from our Soquel store made this little beauty from Better Homes and Gardens Weekend Kitchen Decor to Sew book. Thanks Laura! What's your latest embroidery creation? I love seeing all the projects you've shown us lately. I've tried the Sublime Stitching and like the variety of patterns they have. Has anyone else tried them? Keep showing us projects; great inspiration! !